Spectacular views of the Strait of Georgia combined with hiking trails that lead through beautiful west coast forests makes Lighthouse Park one of the best year-round parks to visit on the North Shore. It’s the viewpoints around the park that make this area a must to visit as the coastal scenery are some of the best in the Vancouver area. 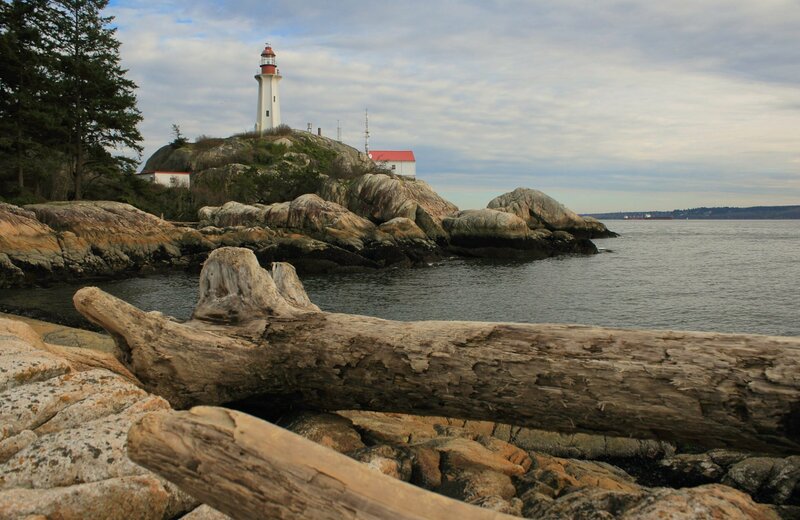 Lighthouse Park is located in West Vancouver and accessed from Marine Drive at Beacon Lane. The Lighthouse itself is situated at Point Atkinson, the point that separates Howe Sound from Burrard Inlet. The first lighthouse was built in 1874 and the current structure was built in 1912, the same year the park land was leased to the District of West Vancouver. The view looking west from West Beach at Lighthouse Park. The view from Shore Pine Point in Lighthouse Park. The view from Juniper Point in Lighthouse Park. West Beach: Located just to the west of the Lighthouse, this angle gives the best view of the Lighthouse along with a great view out towards the Strait of Georgia. This viewpoint is accessed by walking a short distance west from the buildings, following the trail continuing past the Lighthouse viewpoint until you reach a junction where that points to the West Beach Trail on your left. Juniper Point: This viewpoint is located at the northwest point of the park and is easily accessed via the Juniper Loop trail, which begins further down the parking lot. The view is incredible, looking out towards Passage Island, Bowen Island, and Howe Sound. Shore Pine Point: Located west of the Lighthouse, the Shore Pine Point view looks out into Howe Sound and towards the Strait of Georgia and the Gulf Islands. Follow the Shore Pine Trail west and a sign points to the viewpoint to the left. 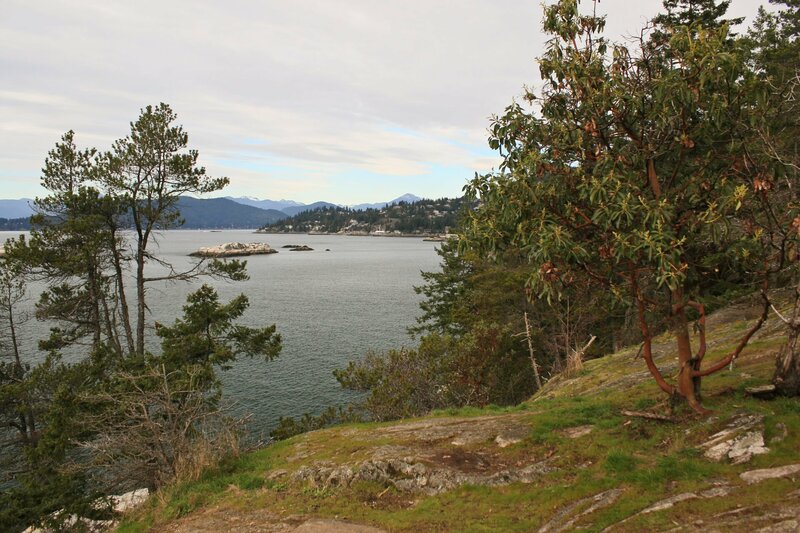 Eagle Point: This viewpoint is located on the east side of the park and offers views of Burrard Inlet, looking across towards Vancouver and even as far as the Lions Gate Bridge. Eagle Point isn’t visited as much as the other views but it’s worth the time and the beautiful hike along the Arbutus Trail. Starboat Cove: While Starboat Cove does not offer quite as wide a view as the other viewpoints, it’s still beautiful without he surrounding coastal rock and view towards Vancouver and the Lions Gate Bridge. You can also rest on the bench on the rocks above or make your way down to the beach to the old boat. The trail to Starboat Cove is located just a short 10-minute walk east of the Lighthouse and buildings. Lighthouse Viewpoint: One of the most visited viewpoints in the park, it’s definitely not the best. Located just a few steps up onto the rock to the west of the the nearby buildings, the trees in the area have grown and block a good portion of the view of the lighthouse and water. End Of The Driveway: If the front gate at the Lighthouse is open, the public is allowed to walk in and go to the end of the driveway. There is no set schedule to when the gate is open, so you’ll just have to be in luck. The view at the end of the drive offers a great view of the lighthouse itself. If you’re lucky, you may spot some wildlife from the viewpoints. Various birds, ducks, geese, and even seals and whales have been spotted from Lighthouse Park. Don’t forget to plan your day in Lighthouse Park to explore the hiking trails as well as the lush west coast rainforest is beautiful and also has many Arbutus trees, a unique coastal tree whose bark peals off.